If you are on a diet to lose weight then you should know the foods to avoid or limit during weight loss program. When you are trying to lose weight, knowing what to eat is just not enough. You need to take note of what you should not eat at all or eat in moderation. First, you need to avoid the foods containing hydrogenated fats. Because hydrogenated fats are very harmful for health and increase the chance of heart disease. Also, avoid the foods with high sugar content as these foods barely contain any nutrient and too much of sugar will increase your weight rather than helping in weight loss. Avoid all foods which are high in saturated fats. Like animal foods, red meat, oil, margarine etc. ; animal foods are high in calories though they may have some nutrients in them but you need to avoid those. As you know fast foods and junk foods are extremely harmful for health so you should not eat convenience foods at all. These foods contain high amount of hydrogenated oils and also high in sodium. Avoid alcohol as much as you can. Alcohol increases your weight. So avoid alcohol or limit your alcohol consumption. Health bars may have a lot of nutrients but high in calories and sometimes contain hydrogenated fats. So it’s good to avoid them. High fat meats, another food you would like to avoid, as these are loaded with saturated fats. Snack foods are very delicious and hard to resist but you should try to avoid eating snack foods or try it in a limit. Avoid butter, margarine and cookies completely. Don’t think of chocolate and milk bars because they are high in fats and calories. Avoid any kind of whole dairy products. Avoid whipped cream or any other cream and only go for fat free ones. Stop eating ice cream and cakes. Also, forget about potato chips and candy! Try to avoid the eggs and if you are a big egg fan then only eat the egg whites. Nuts and peanut butter are great for health. But these are not weight loss foods. High calorie content in nuts and nut products are bad for weight loss. 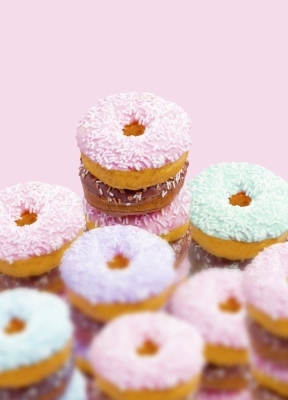 Pies and donuts are very high in calories and loaded with fats. Avoid these foods completely. Alcohol increases your weight. Do not consume alcohol if you are trying to lose weight. Avoid meat as these are loaded with saturated fats. You should limit on fat and sodium intake. Avoid foods that are high in calories and low in nutrition as they can destroy your weight loss efforts and may even potentially negatively affect your overall health. Remember, when you are on a diet it is important to choose good nutritious foods and discard others. But how much you eat is also very important. Huge meals or large portion of anything won’t help your weight loss program. Great suggestions and some interesting comments to boot.Avoid All foods which are high in saturated fats. Like animal foods, red meat, oil, margarine etc to reduce your weight..Diet for weight loss fast foods and junk foods that contain high amount of hydrogenated oils and also high in sodium should be avoided.